Ripping all your music to your PC is a great idea, you get a backup of your CD collection and it’s much easier to manage your music. Making compilations and organising your collection is done by the click of a mouse and in faster than real time, it’s a great advance. The problem though is that once all your music is stored on your computer, that’s where it stays. You can stream that music to other devices though; if that sounds complicated don’t worry modern music devices are fantastic at making the process really simple. The first thing you’re going to need is some kind of network. Few homes have built-in wired network points, so the best option is probably going to be a wireless network. These are easy to set-up and provide more than enough bandwidth for audio streaming. All you have to do is plug your PC into the network and you’re half way to a wireless streaming solution. The application that you use to copy your CDs is likely to have some kind of sharing option. Software sometimes comes with iPods, or it can be downloaded from certain sites on the internet. It’s available for Macs and PC’s and lets you stream music to other computers on your home network through a simple option in the preferences. The trouble with this approach is that you need a computer in every room and that’s a very expensive way of getting music around your home. 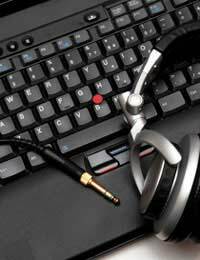 The best option is to use an audio streaming device. These jump on to the network and search out your PC to find any music stored on them. They can then play any audio files without you needing to invest in an expensive PC. There are various versions of these devices, but they will all have a display of some kind that allows you to navigate all your music and playlists. More advance ones will have access to Internet radio as well so you can listen to stations from around the globe. Setting up an audio streaming player is very straightforward. You may need to run some installation software to enable your PC to see the player, but in most cases the player will find your network without the need for extra drivers. You might need to invest in a separate pair of speakers to attach to the units as some simply stream audio. Whichever way you stream music around your home you’ll be struck by the simplicity of the system. It’s great for parties and gives you back control of your music. You can even stream your music to multiple locations at once so it’s possible to listen to music in the kitchen whilst the kids listen to something in their rooms. Audio streaming adds a new dimension to your home entertainment system and gives you unprecedented freedom and choice over who listens where and when. No more squabbling over who gets to use the CD player, everyone can get what they want whenever they want it. The article is re-assuringly simple to read and understand for one such as myself with little or no technical expertise. It confirms that it is possible to what I was thinking about, although not in the terms of audio streaming and bandwidth etc. However I got to the end of the article and thought so far so good, now onto the next step and then was struck with exactly the same questions that Baz asked, " what is an 'audio streaming device'? What does it look like? How is it connected to your HiFi? How much are they? Where can I get one?" So any answers to Bazs' questions? Yes but; what is an 'audio streaming device'? What does it look like? How is it connected to your HiFi? How much are they? Where can I get one?